Search " $2 Mini Roo" 8 results have been found. 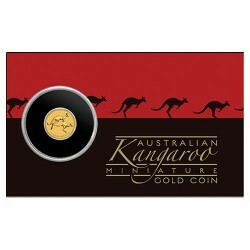 2015 $2 Mini Roo 0.5gm Gold Bullion Coin in Card This delicate, button-sized release presents a golden opportunity for anyone to own an iconic Australian coin. The design portrays a kangaroo in outback Australia and is struck from 99.9% pure gold. 2016 $2 Mini Roo 0.5gm Gold Bullion Coin in Card This delicate, button-sized release presents a golden opportunity for anyone to own an iconic Australian coin. The design portrays a kangaroo in outback Australia and is struck from 99.9% pure gold.